My home studio began with an announcement at the Thanksgiving dinner table a few years ago. When I told my family that I had this tender little dream of becoming an audiobook narrator, in the best tradition of well-meaning relatives everywhere, they immediately started expressing their opinions. I expected objections and cautionary tales, but to my surprise and delight, what I got instead was support. First, my boyfriend - an accomplished carpenter - said he’d build my home studio. Next, one of my nieces and her boyfriend - both trained audio engineers - offered to do the acoustic treatment and teach us to use the equipment and software. Another niece - an actress - said she’d help me practice. Finally, my sister - a commercial photographer - volunteered to take promo shots for my website. Gulp! Shooting my mouth off was already paying off. Maybe this voice over idea wasn’t so far-fetched after all. I live in wine country in Northern California. 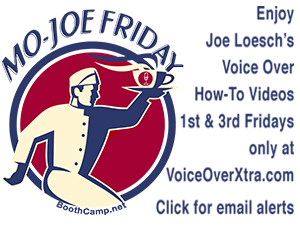 It’s a two-hour commute from my home to San Francisco – the nearest commercial voice over center. From the beginning, I knew that I’d need my own studio - at least for auditions, if not finished audio tracks. Following advice received from Edge Studio, I shopped for basic equipment at a music store, where I was able to try things out, and determine what worked best for me. I’m very glad I did this, because online shopping would not have allowed me to sample the variety of equipment that I did. My headphones are Sennheiser HD 280 pros. I invested in Monster P500 cables, and my interface is a ProTools M-Box2. 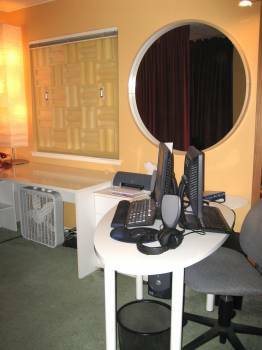 2) a room I could convert to other uses when I needed it. Plus, I wanted my home studio to be both attractive and functional. My first design idea came in a round-about way – from a bulletin board at the music store. There, much to my dismay, I discovered that half of the other artists in my area were using the same image on their business cards as I was – a gold microphone in front of red velvet curtains. I immediately resolved to find a new logo, but rather than throw the baby out with the bathwater, I decided to keep the curtains - literally. 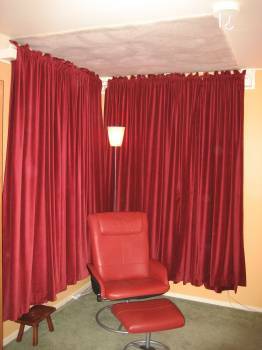 Overstock.com had a great price on floor-to-ceiling red velvet drapes. Beginning with these drapes, I designed a four-sided booth. They have moveable sections that swing from the corner of the room to hooks in the center of the ceiling. My resourceful boyfriend, Fred Campbell, created center and side mounts out of MDF (medium density fiberboard). It also has swing arms made from standard PVC plumbing fixtures. The resulting booth is large enough for me, a copy stand, a mic and mic stand, a chair (for long-form narration), and even several other people when ensemble work is required. The ceiling was originally covered with acoustic foam squares, but when they started falling off - bonking me on the head while I was performing - I pulled them down, and put carpet on the ceiling instead. The entire room has carpet on the floor, so that helps too. A custom-made baffle fits in the room’s window when a recording session is in progress. It’s made from a masonite board that separates plain foam on the exterior, which stabilizes the window glass. There is also acoustic foam in the interior, which baffles room noise. Two handles ease the placement of this in the window recess. A curtain over the room’s closet muffles sound and replaces standard sliding doors. One drawback I’d cite to my home studio design is lack of air flow. So this year’s upgrade will include new ventilation. I have central air conditioning – essential in my region’s triple-digit summer heat – but it’s not enough. Another hazard is the sound cables snaking across the floor from the mic in the booth, to the ProTools M-Box. We’re all very careful, but I’m conscious of the potential for accidents, and always tuck the cables as far out of the line of traffic as possible. 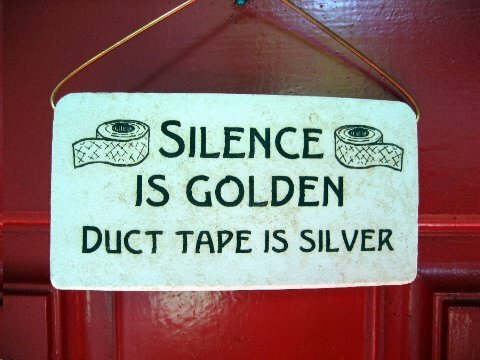 The final flourish on my home studio is the sign I put on the front door when I’m in a recording session. Here, a picture is indeed worth a thousand (unspoken) words. 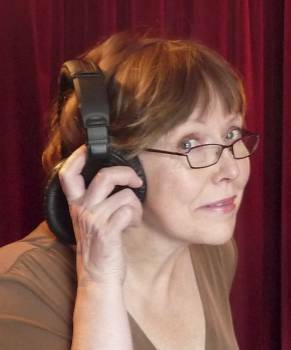 Elizabeth Holmes is voice actor and aspiring audiobook narrator living in Healdsburg, CA. Nice article - accurate, amusing, informative! I find this SO helpful as I'm starting to upgrade my home studio. The photos of this studio and the moveable walls give a great visual which is terrific! Thanks! This is so helpful and so fun to read! What a cool woman! Kudos Elizabeth on your submisson regarding the setting up of a "home studio". I look forward to sharing your ideas with my other students to show them what a little ingenuity and industriousness can produce. This is terrific, Elizabeth. You and Fred have created a professional studio out of basic materials. This article will inspire others with similar dreams. GO GO GO! It’s such a wonderful, satisfying feeling to get our home studio dialed in and have a great place to record our voice-over projects, isn't it? I remember many years ago my first “studio” was my bedroom closet and a $30 Radio Shack microphone! How times have changed. One of the beauties of our voice-over careers is to see the evolution of our studios, as our careers progress. Also, I love how you write as well. re: Soundproof blankets... I skipped these for aesthetic reasons. Fortunately, the thick folds of the velvet drapes I used work equally well to deaden sound. This is a great article, which will probably inspire others! I have heard the impressive sound quality that you produce from your in-home recording studio, so I can attest that you did a wonderful job. Your recordings are very professional. Thanks, Elizabeth! 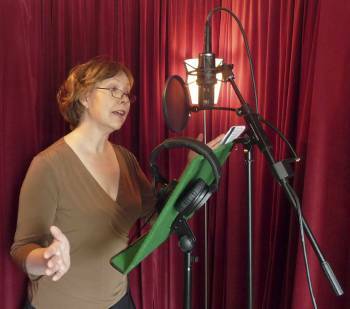 I, too, quit my day job to pursue the audiobook narration dream and am always looking for home studio ideas. Yours is a great article - written well and from the heart, full of useful information, and with great accompanying photos. Your article joins a treasure trove of others that John Florian has put together for the voice community. You're in good company! 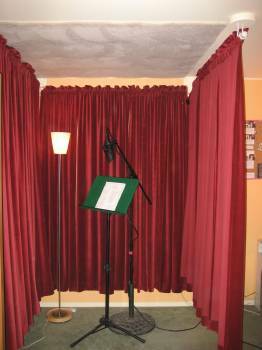 Seriously, what did you do to make sure your recording space is soundproof? How do you deal with low rumble noise and vibration? Have you considered using soundproof blankets instead of velvet drapes?